Summary: What is the basis of Hinduism? From which sources does Hinduism derive its knowledge, beliefs and practices? In this essay we explore the sources of the sacred knowledge of Hinduism, with specific reference to its literary sources and how they help the tradition cope with the changing times. When we attempt to understand the nature of Hinduism, first, we have to examine the thought process that went into the formation of it. We have to know from where Hinduism draws its inspiration, doctrine and beliefs. Hinduism is unlike any other religion. It has no founder and no particular text which can fully represent it as in case of the Abrahamic religions such as Christianity or Islam. Its philosophy, beliefs, practices, customs and traditions are derived from numerous sources. However, we know that the Vedic religion or Brahmanism constitutes it core and overtime all other sects and traditions of Hinduism have aligned themselves to its core beliefs. Therefore, if we want to understand the scriptural basis of Hinduism or the scources of its knowledge, we have to first examine the texts that shaped the Vedic religion and how they still continue to influence Hinduism also. In this article, we will examine the main literary sources of Hinduism and their importance in the growth and development of Hinduism. The ritual and spiritual knowledge of Hinduism, its philosophy, beliefs and practices are derived principally derived from three sources namely, the teacher traditions, ascetic teachings, sectarian works, and literary sources. Hinduism continues to derive its doctrinal knowledge even today. For a longtime the teacher traditions or guru traditions played a significant role in promoting and preserving the knowledge of Hinduism. They brought to light the secrets hidden in the principal texts of Hinduism, adding their own revelations and interpretations wherever necessary. Their knowledge was preserved through successive generations by the tradition of gurukrama or succession program in which each master chose his successor through a careful selection process by following a set of rules and precedence’s. Apart from teacher traditions, India also witnessed the rise of numerous ascetic movements who drew their inspiration from the sacred texts of Hinduism and in turn enriched its theology and spiritual philosophy. Sometimes, the distinction between the guru traditions and the ascetic traditions was rather blurred since they both followed the same principles to transmit knowledge or ensure their continuity. Nevertheless, they contributed to our understanding of Hinduism. Our knowledge of Hinduism also comes from Hindu sects namely Shaivism, Vaishnavism, Shaktism and Tantra. All these sects might have originated independently, but in course of time they became integrated into the Vedic tradition. Yet, each of the sects has distinct identity and its set of beliefs and practices and literary resources. They also contribute richly to the sacred knowledge of Hinduism. Hinduism has neither a founder nor a principal, sacred text. However, we cannot say that it has no scriptural basis. It is a religion with too many gospels. Although, Hinduism does not exclusively rely upon any particular scripture, it derives its inspiration from various sources, most of which are literary. The Vedas and the Agamas are the important sources among them. Apart from them we have the Vedangas, the Puranas, the epics Ramayana and Mahabharata, the sutra literature, numerous commentaries (bhashyas), law books or Dharmashastras, the works of various schools of philosophy (Darshanas), literary and secular works such as those of Kalidasa, vernacular literature, the teachings of numerous Shaiva and Vaishnava scholars and spiritual teachers such as Shankara, Ramanuja, Madhava, the works of foreigners who visited India in ancient times, and so on. Traditionally, the Upanishads, the Bhagavadgita, and the Brahmasutras are considered the three most important sources (prastana traya) to corroborate or confirm the validity of any belief, truth or practice of Hinduism. However, it is difficult to say the relative importance of each of these sources. The Vedas are undoubtedly the most indisputable sources of Hindu belief system. However, we cannot say that all Hindus regard them with the same respect and veneration. Those who practice Shaivism or Vaishnavism look to their principal sources. People who practice Tantra, draw their inspiration from the Agamas or the Tantras and may even totally ignore the Vedas. While scholars and spiritual teachers may debate the relative importance of each of these works, the common Hindus may not even bother to read any texts. It is not an exaggeration to say that most of the Hindus may never read the Vedas, the Upanishads or any of the principal texts. Yet we cannot say that they do not know about their faith. They draw their knowledge from spiritual teachers, friends and relations, television programs, movies, movies and magazines. Some may even read the texts of other faiths such as Buddhism, Jainism or Sikhism and appreciate the similarities and the underling unity. Most importantly, when you look at the masses of the Indian subcontinent who are either illiterate or poor, with little or no access to any literary information about their faith, you will realize the incredible and unquestionable impact of oral tradition and family practices upon their religious lives. In Islam and Christianity, the Church and the State played an important role in enforcing the faith and ensuring that people adhered to the basic doctrine. They had the power to punish those who violated the established norms. Hinduism has some institutions which derive their authority from the scriptures or from the tradition, but their jurisdiction and authority are limited. Even if the kings of ancient India patronized Sanatana Dharma and took upon themselves the duty of enforcing the Dharma, it is highly doubtful how far they were able to extend their authority. The village heads and the higher castes enjoyed numerous privileges, but their power over the lower sections of the community varied in proportion to their own status in society. For all practical purposes, in the long and checkered history of India, the Hindu masses mostly remained outside the purview of any organized, religious authority. They practiced their own gods according to their beliefs and family traditions and had their own unwritten code of conduct as dictated by custom, usage, and convenience. Yet, their loyalty to the traditions of their ancestors had been unquestionable. Theirs was a folk religion, which was based upon simple faith. However, they too were Hindu who could easily relate to any discourse or mythological story from the Puranas or the epics Ramayana or the Mahabharata. In its long history Hinduism also encountered a lot of opposition and competition from rival traditions. Prominent among them were Buddhism and Jainism. Both of them denied the existence of God. They questioned the validity of the Vedas and the main doctrines of Hinduism, offering at the same time alternative solutions. Although they opposed Hinduism, one could not fail to notice how the interaction left a positive influence on each and shaped their beliefs. Hence, if you want to understand Hinduism, you have to pay attention to the rival literature of Buddhism and Jainism also. They are especially useful to understand some aspects of its history and growth. From the earliest times, Hindus spoke numerous languages, while Sanskrit remained its many literary languages. The languages, which are spoken by Hindus, are either Sanskrit based or Dravidian. However, you may see that almost every Indian language contains numerous Sanskrit words or its derivatives. Officially, Hindus speak in about 20-30 languages. However, if you consider the dialects and others, the number may run into hundreds. These languages developed and matured overtime into their current form. Their increasing popularity resulted in the emergence of a vast body of Hindu religious literature in vernacular languages. The rise of Hindu theistic movement (bhakti) also contributed to its growth. Some of the important vernacular works of Hinduism are Ramacharit Manas, Tirukkural, numerous translations of the epics and Puranas, the Prabhanda Kavyas of the Telugus, the Vaishnava literature of Bengal and the composition of numerous saints from Andhra Pradesh, Karnataka, Maharashtra, Kashmir and elsewhere. Their growth had a negative impact on the traditional Sanskrit literature upon Hinduism. The popularity of vernacular literature, coupled with the secrecy and caste discrimination associated with the teachings of the Vedas led to the relative decline in importance of the Vedas and other Sanskrit works. Until the eighteenth century, the Vedas remained in the memory of the Brahmanas. For over three thousand years they were passed from one generation to another through the oral traditions. The young students who were initiated into the study of the Vedas had to recite and remember the thousands of verses by heart. Most of the students, who recited the Vedic hymns and sang them during the sacrificial ceremonies had no knowledge of what they had meant since the hymns were composed in archaic Sanskrit with hidden symbolism. It has some negative consequences. Due to lack of knowledge, the priests focused upon empty ritualism and sacrificial ceremonies, rather than the spiritual aspects of the Vedas. The Vedas themselves emphasize that ritual knowledge is inferior knowledge and should be discarded for the higher knowledge of the Self. The trend continues even today. Many Hindus, go temples and offer ritual worship. They do the same during domestic worship also. They recite the mantras and prayers without knowing their true meaning and significance. Whether it is a naming ceremony, marriage ceremony, conception ceremony or funeral or some other religious ceremony, they observe the various samskaras and household rituals out of fear or respect towards their family traditions, ancestors and gods rather than as part of their spiritual practice to achieve liberation. Even to achieve liberation people prefer taking dips in the sacred rivers or offering prayers instead of working for their self-purification or inner transformation. This superficial approach to the practice of Hinduism makes it rather shallow, bereft of its true merit, which is liberation. One of the chief reasons for this development is that the sacred texts of Hinduism, irrespective of whether they are in Sanskrit or in vernacular languages, are too complex for the ordinary mind to comprehend whereas to practice rituals you depend upon either a priest or the procedure itself without having to exert yourself. It is true that in the information age Hindus are gradually turning towards spirituality and learning more about their sacred texts and the knowledge which is hidden in them. People can read the Vedas, the Upanishads, the Bhagavadgita and numerous other works, without seeking anyone’s permission and without the fear of censure or disapproval. A century ago it would not have been possible, unless you were born in a higher caste or a privileged family. Because of the increased awareness and a noticeable shift in emphasis, the popular and noticeable visage of Hinduism is gradually transforming. Increasing number of people are now perceiving it as a spiritual and mystic tradition rather than a superficial, ritual or ceremonial tradition. Rituals are still considered important to Hinduism. However, they are viewed in the context of their spiritual value and hidden symbolism. This is a very positive development, which elevates Hinduism in the public mind. Gone are the days when the critics of Hinduism could freely denigrate it as a Satanic cult. People now recognize its spiritual value in the modern age, its flexibility and adaptability in accommodating people of diverse backgrounds to practice their faith according to their lifestyles, beliefs and worldviews. Because of these developments, Hinduism now has a greater possibility of thriving in the modern age of technology and scientific realism and withstand the new challenges it might face from the new discoveries, inventions and exploration of the universe. The Vedas, the Upanishads, The Puranas, the two great epics, the Darshanas, the Sutras, the Smritis, the Bhagavad-Gita and a whole lot of religious literature, still have a bearing on the religious lives of Hindus. However, it is doubtful if present day Hindus, would be still interested in their traditional meaning or look for new interpretations and commentaries considering our increased knowledge and understanding of our world. In conclusion, we may say that though Hinduism draws its inspiration from numerous sources, a few sacred texts such as the Vedas can be considered central to its beliefs and practice. They will continue to enjoy the privileged status in future also. 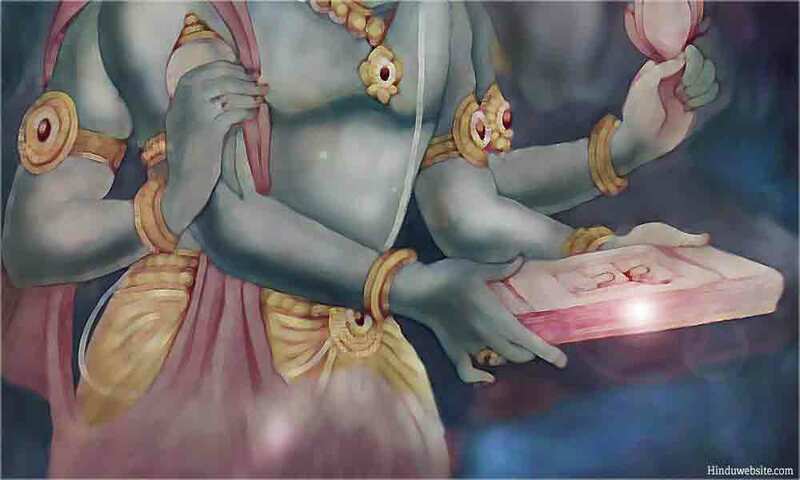 In recent times of all the texts the Bhagavadgita gained enormous popularity with all sections of Hindus. It has almost become the principal text of Hinduism. The Upanishads continue to interest those who have a spiritual bent of mind. In addition to them, Hindus also draw their inspiration from the teachings and sayings of many saints, gurus, bhagawans, rishis, maharishis, peers, babas, scholars and philosophers. The also try to correlate the knowledge from space research, quantum physics, biological sciences, psychology and parapsychology with the knowledge contained in the scriptures. Surely, if there are any religions which can survive the growth of science and technology and the modern scientific knowledge, it will be the religious traditions that originated in the Indian subcontinent, among which Hinduism is the foremost.